Initial feline coronavirus: Most FCoV infections are subclinical showing upper respiratory tracts signs or diarrhea. Coronayiral Enteritis: FCoV can cause transient and clinically mild diarrhea and vomiting in cats. Feline infectious peritonitis: Two basic forms of FIP-effusive(wet) and FIP-noneffusive (dry) have been characterized. Cats with effusive FIP usually only survive a few days –weeks at best. Cats with noneflusive FIP can survive many weeks or months, although after neurologic signs begin, death usually occurs fairly rapidly. -Diagnosis of cats with suspected feline infectious peritonitis (FIP)-FCoV Ab test is only one of parameters for the diagnosis of FIP. -Testing a cat that has been in contact with a cat suspected of excreting FCoV. -Testing before mating with known positive or negativecat. -Screening a household for the presence of FCoV. -Screening a cat for introduction into a FCoV-free household. Many healthy cats and the cats with conditions other than FIP are FCoV Ab positive. Some cats with effusive FIP appear to have low titers or are FCoV Ab negative. 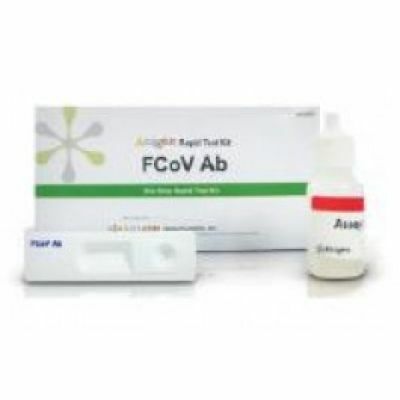 FCoV Ab testing should only be performed to diagnose FIP inconjunction with a compatible history, clinical signs, and examination of effusions or blood or high globulins and a low A:G ratio.